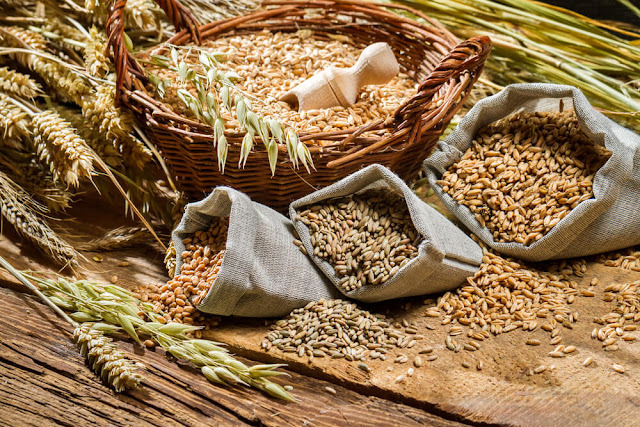 Integral grains until the beginning of the 19th century were an integral part of the nutrition of our ancestors, when the new technology developed a flour mill with wheat processing rolls, so the integral flour from whole wheat grains was replaced by "white one." This discovery led the modern man degrade all that our ancestors cultivated for their diet. After replacing the integral flour with white one, the modern man made only one in a series of mistakes in creating a substrate for the development of many diseases. It is easy for white flour to be better prepared for the preparation of fine pastry and cakes, we must be aware that it contains only starch, and that it is poor in nutritious ingredients which are in abundance integral grains. Integral grains represent a blend of seeds and fruits and are a treasure trove of materials necessary for good health, as well as a long healthy life. WHY ARE INTEGRAL GRAINS SO BENIFICIAL? Regular consumption of whole cereal grains reduces the risk of many very serious and widespread diseases, such as high blood pressure, increased blood cholesterol, diabetes mellitus, diabetes, gastric cancer, colon and prostate cancer. Also, integral grains help maintain ideal body weight because they contain plant fibers that give our body a sense of satiety, and thanks to its complex carbohydrates that contain fibers, help the body burn calories faster. In addition to containing dietary fibers that are useful for better digestion and complex carbohydrates, depending on the type - integral grains, contain from 7% to 14% protein, various minerals (magnesium, zinc, iron, selenium ...), vitamins (A, B, E ...), protein, folic acid and an enviable amount of antioxidants, which are an ideal combination and necessary for human organism. On the other hand, day-to-day consumption of white-flour products deprives the body from essential ingredients that are contain whole grains of cereals. The human organism will never adapt to such a diet. Wheat is one of the most integrated integral grains in the world, and is used for the production of bread and pastry. Whole wheat grains contain 70.7% of carbohydrates, 10.2% proteins, about 2% fat, 1.7% of minerals, vitamins B, E, D, K and provitamin A (which can only be found in wheat). When it comes to minerals, we can find phosphorus and potassium, then calcium, iron and magnesium. Wheat is mainly used in the form of flour, but it can be cooked and mixed with other cereals and consumed for breakfast, with the addition of dry fruits and nuts, honey, cinnamon. It contains gluten and is not recommended to people with celiac disease and who have allergy to this protein. Read more in the article celiac disease symptoms. Integral wheat grains strengthens immunity, promotes the growth and development of the organism, it is beneficial against abnormalities and exhaustion in anxious people, it treats rash, lichen and inflammation of the skin, regulates digestion and is used against inflammation of the throat and cough, poisoning and pain, heart disease and premature aging. Millet is very special and valuable for human consumption. It falls into rare integral cereals that do not contain gluten, and it is equally unique for its pH. It is known that acidic pH of blood is suitable for the development of all diseases, and it is advisable that a person consumes 80% of basic and 20% acidic foods, and the millet has alkaline properties. Read more in the article on alkaline diet, which also contains gluten-free grains in the article gluten-free diet. It contains as much as 15% protein, large amounts of vitamin B, E, silicon, iron, but also magnesium, phosphorus and potassium. It is easy to remove its shell, it belongs to integral grains, and since it is very easily and quickly prepared, it is suitable for modern housewives who want to provide their family with healthy and fast meals, and the recipes are quite present in everyday life. You can add it in soup and instead of noodles, mix with boiled vegetables as a supplement to the main meals, prepare it in the form of a delicious porridge for breakfast, pudding, cake. Thanks to its composition, millet strengthens hair, skin and nails improves the work of the heart, stomach, spleen and pancreas, restores the cells and intestinal flora, is useful in the treatment of anemia, nervousness and depression, alleviates fatigue, positively affects immunity and is very important for diet of diabetics. Oats are one of the main foods in the menu of people who want to eat healthy. Indeed, oats are extremely useful and can be eaten without fear of weight gain. Nutritionists claim that oatmeal is the best choice for the beginning of the day, as it supplies the body with the necessary energy. Oat in grain is rarely used, probably because it requires more time to prepare. Oat flakes are extremely nutritious, because almost all natural ingredients in the grain are preserved. Due to the high content of minerals, especially calcium, phosphorus, iodine, potassium, iron, zinc, magnesium, copper, manganese, sulfur, sodium, fluorine, E, B, H, and amino acids, which stimulate the growth and the formation of red blood cells - oats are more medicine than food. These integral cereals are also known for their high content of easily digestible proteins, and they contain 7% of fat, but without cholesterol. Flakes can be eaten with milk (plant or animal), yogurt, crushed juices, water, dry and crisp fruits, honey, nuts, or added to the soup. It cleanses the blood, helps in the treatment of diabetes, bile, liver, leukemia, gangrene, kidneys, bladder and urinary tract and other urinary infections, various inflammation, spleen, ovary, uterus. Oatmeal successfully stops the formation of caries, and oats tea is great for stomach problems. This is the most widespread grain in the world, but, unfortunately, it is most commonly used in refined form (white rice), without callus (bran), which is absurdly used in animal nutrition. Otherwise, rice is often sink into liquid paraffin (oil derivative) after glazing, which coats and prolongs the grain shelf life. On the other hand, integral rice is very healthy, nutritious, easy to digest and healthy. They can be freely used by people with celiac disease because it does not contain gluten, and is desirable in the diet of diabetics because starch is slowly absorbed. Integrated rice can be combined with legumes and other vegetables, fish, and from it is made sweet pasta and sweets with rice. One of the common questions on our site is whether the rice causes weight gain. Read more in the article rice diet. Stabilizes blood sugar and blood cholesterol levels, supports the function of muscles, nerves and lungs, causes satiety and provides good form. It works soothing to the central nervous system, relieves anxiety, depression and helps in the treatment of sick lungs. It can also be used by patients with gastritis - heartburn, gastrointestinal tract and duodenum, diabetes, and people with excess or gastric acid deficiency. Mitigates the problems in the digestive organs and protects against the formation of stone in the kidneys. Bran mixed with water is used to maintain skin quality and against skin diseases, and pillows are usually filled with it for better sleep. Spelt belongs to integral grains (wheat varieties) that has been almost forgotten, but recently, for some reason became popular again. The advantage of the spelt over ordinary wheat is multiple because this plant does not tolerate chemical treatment, it contains less gluten and more vitamins, minerals and essential amino acids, and is much easier to digest. It contains all the vitamins B - groups (except B 12) and has seven to eight times more calcium, phosphorus, magnesium and selenium than other cereals. Since spelt minerals are bound to organic carbon, they can be completely absorbed in the body. It is extremely rich in zinc and has a relatively low glycemic index helping to maintain normal blood sugar levels. It is useful in the diet of athletes and those who need to regain strength after a disease. Spelt raises immunity, it is effective in treating intestinal diseases, removing metabolic disorders, kidney disease, in case of overuse of drugs and various food allergy-related symptoms. In some clinics in Germany, these integral grains are included in the treatment program for many disorders: chronic infections such as herpes and sidewalk, bone and nerve disease (Parkinson's disease, Alzheimer's disease, rheumatoid arthritis), cancers and the consequences of prolonged use of antibiotics.